Exposed Skin Care Review – Does Exposed Help Anyone? Exposed Skin Care has become incredibly popular and I want to see whether that’s justified or not in this real Exposed Skin Care review. My main question is: Does it work? But first let’s take a look at what Exposed really is and what it does. What I like about this product is that it combines science and nature. While they add medicated active ingredients to give it more power, it has many of the natural remedies we talk about on this website added to it for an extra powerful skin clearing effect. This combination of medicine and herbal treatments also results in a more gentle effect, while preventing further outbreak. Many claim this product also improves the overall appearance of their skin, which is a great added bonus. The main active scientific ingredients in Exposed Skin Care are Benzoyl Peroxide, Salicylic Acid, Glycolic Acid, Azelaic Acid and Sulfur. Their main purpose is to kill bactera causing the spots and blackheads while clearing clogged pores. The natural remedies included are: Licorice Root Extract, Sage Extract, Aloe Vera, Green Tea, Tea Tree and Passion Flower Extract. These natural ingredients help to heal the skin in a gentler way due to their antioxidants and anti-inflammatory effects. The herbal treatments also work to reduce redness. Is this the best acne product? There are so many products out there promising to cure your acne. So how does Exposed Skin Care compare to other popular treatments such Murad or Proactiv? 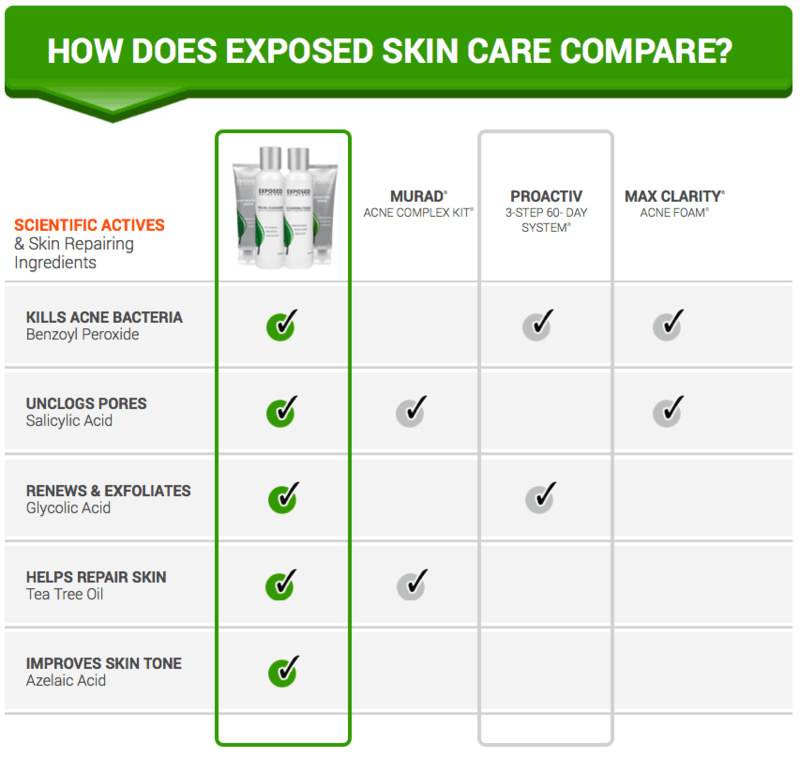 The chart below shows a clear comparison of Exposed vs. Proactiv, Murad and Max Clarity. As you can see this is the only acne treatment that kills bacteria, unclogs pores, renews, repairs and exfoliates the skin while also improving skin tone. This really is a full treatment and will therefore increase your chances of this solution working for you. The combination of Benzoyl Peroxide and Salicylic Acid is a very powerful one. The main purpose of these two ingredients is to exfoliate your skin. It does this by removing excess oil and cells, while unblocking the pores. This is the basis of any medicated over the counter pimple treatment. Combining these two does increase the power and they do things slightly different, so the effect in theory should be better. The problem with these two potent ingredients is that they have been known to dry out skin. So if you have sensitive skin, you will want to monitor carefully how it’s affecting you. The natural herbal ingredients should counteract that somewhat and the official website actually states that there is no over-drying of the skin due to its unique formulation. Like I say throughout this website, not every treatment will work for everyone. Some of the free homemade herbal remedies we recommend work great for some people, while others see no results. The same applies to every product that is sold to remedy skin breakouts that I have looked into. However, let’s take a look at some Exposed Skin Care reviews by actual users to decide whether you should try it or not. 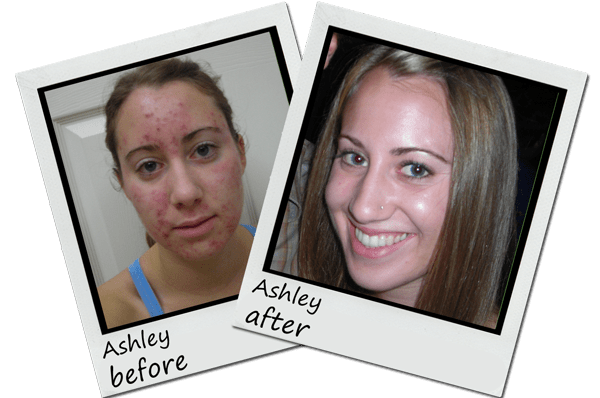 These are very impressive results, especially the speed at which people see results and the fact that customers are seeing permanent clear skin. Customer feedback and real testimonials is something I always look at when reviewing a treatment and Exposed scores very highly on that front. You can buy various products from Exposed Skincare depending on your needs, including a facial cleanser, a serum, a scrub and even a special cloth – and much more. However if you click the link below you’ll have the chance to buy a kit (either a basic, expanded or ultimate kit) which gives you a large discount (automatic coupon code applied). On top of saving money, they actually give you a 30 day guarantee. On top of that, they also have a 1 year guarantee, which I’ve never seen before on an acne treatment. When I saw these guaranteed, I just had to review and recommend this product – since it gave me so much more confidence in whether Exposed really works or not.